As an Indian, Sri Lanka has always fascinated me because the island is so very deeply intertwined in Hindu mythology. The two nations were connected by a mythical bridge built by an army of monkeys, and Sri Lanka was the backdrop for an epic fight between a prince and a 10 headed king to rescue a princess. When I got a chance to go to the island nation for a friend’s wedding, I seized the opportunity and was completely charmed by the country and more so by the people. As a travel destination, Sri Lanka has a veritable treasure trove of unique experiences to offer. Pearl of the Indian Ocean it is, indeed. Here are my top reasons to add Sri Lanka to your bucket list, though to be honest, I could have listed at least 20 more reasons. Sri Lanka is the world’s fourth largest exporter of tea in the world. Think Ceylon Tea, think Sri Lanka, because that’s where it’s from. While the hilly regions around the island are littered with tea plantations, Nuwara Eliya is one of the most popular regions for tea cultivation. Referred to as ‘Little England’ there are several plantations dating back to the Colonial Era where one can learn the nitty-gritty about tea production. Tip: This is the coldest region in Sri Lanka, with the temperature plummeting down to the low 40’s in the night. Make sure to bring warm clothes! I don’t think there is anything better than eco-friendly luxurious experiences in the midst of nature, is there? Not only is the Jetwing Vil Uyana Hotel absolutely beautiful, it’s one of the most successful eco-tourism initiatives in the country. Thirteen years ago, it was just a patch of abandoned paddy fields. Today, it has been transformed into a nature reserve with five different kinds of habitats that are home to birds, reptiles and several primate species, including the rare grey slender loris. Spread out throughout the 28 acre property are stilted villas, each with their own bathtubs and open-air rain showers. Some villas come with floor-to-ceiling glass walls, while others have their own private plunge pools. The library is built on a platform that floats above a lake, while the spa is right in the middle of another. Sigiriya Fortress is built on a 650 feet high plateau that was formed by magma eons ago. Built around the 5th century BC by King Kashyapa to hide from his brother, the fortress consists of a palace (aptly named the Sky Palace), surrounded by a beautiful network of landscaped gardens and water reservoirs. The way up to the top takes you in and out of gardens, caves, and practically into the belly of the beast, as the gatehouse leading up to the Palace was once shaped in the form of a crouching lion. If you like your cultural experiences with a side of adventure, this is the place to go, as parts of the climb are steep and not for the faint hearted. How come? Well, yes, the country is only about the size of Ireland, but 24 wildlife reserves still manage to fit within it. Sri Lanka’s isolation as an island, its mild climate and favorable topography has led to an amazing level of biodiversity-including several organisms that can’t be found anywhere else on earth. Head to Yala to catch a glimpse of the elusive Sri Lankan leopard, Wilpattu for sloth bears, or Uda Walawe for wild elephants. If its endemic birds that you want to see, head to Sinharaja. No, I’m not kidding, it really exists. Located within Hortons National Park, the World’s End is a sheer cliff face with a drop of around 1200 m. Getting there requires an easy trek through the park where you can catch glimpses of deers and birds. 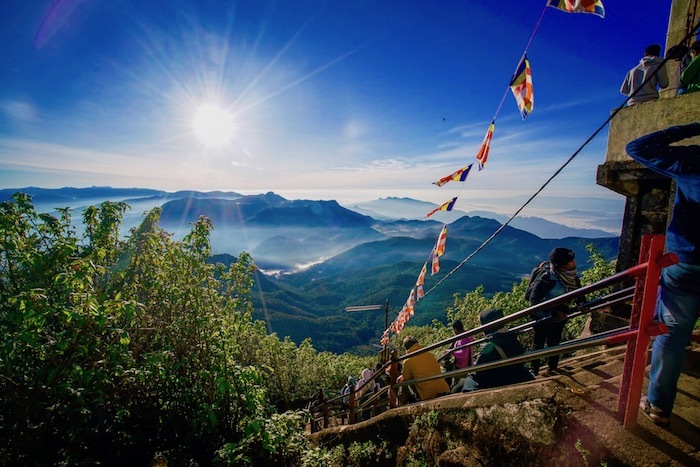 If you’re in luck, you will be able to catch an uninterrupted panoramic view of rolling hills (including Adam’s Peak), tea plantations, and even the Indian Ocean. If you think Sri Lankan food is similar to Indian food, well, think again. Rice is always the most important part of the dish, and you’ll find it in various forms. Kiribath is rice cooked with coconut milk, usually served with lunu miris, which is a sauce made from chili. Rice with curry (never curry with rice), usually consists of rice accompanied by fish, beef, chicken or jackfruit curry. Hoppers and string hoppers are made out of fermented rice batter, and usually had with lunu miris, or dhal. Kottu Roti, or shredded flatbread with veggies, seafood or meat, is the quintessential Sri Lankan street food that can be found everywhere from roadside stalls to high end restaurants. It is one of the most versatile dishes that can be eaten at any time of the day! Midnight craving? Kottu. Breakfast food? Kottu. Hangover cure? Kottu! Located on the southern end of the island, Mirissa is a stunning crescent shaped sandy beach, where you can surf or just chill and watch the world go by. But what Mirissa is the most well known for, are the the whales that are found close to the shore line, having a veritable microscopic feast in the plankton-rich waters. Nowhere else in the world are whales found venturing so close to the shore! Blue whales are a common sight, as are killer whales, sperm whales, and several species of dolphins. There are several whale watching boat companies that great care to conduct their tours in a sustainable way, without harming the animals. I love Raja & the Whales, which is a family run whale watching tour operator that is well known for their sustainable practices, and are directly involved in whale conservation as well. Tip: The best time to spot these cetaceans is during the winter months, when the seas are calm. No visit to Sri Lanka would be complete without stopping at least one of the the enchanting Buddhist Temples found on the island. Some of them ancient, others more modern, but each is beautifully designed and adorned with breathtaking paintings and sculptures. The 2,200 year old Dambulla Cave Temple Complex is a surreal example. Consisting of a total of 80 caves linked together, there five main shrines in the complex. Housed within these shrines are around 150 statues and murals of Lord Buddha whereas the walls are decorated with carvings and paintings, colorfully weaving together scenes from the life of Lord Buddha. The caves also provide a stunning vantage point, with countryside for miles, and Sigiriya visible in the distance. Long before Sri Lanka was known for tea, it was well known for its spices, such as cloves, sandalwood, turmeric, cardamom, and especially cinnamon, which is native to the island. The Arabs were the primary traders of cinnamon, introducing it to the rest of the world, and they were so protective about where they sourced it from, that they weaved fantastical tales to dissuade competition (giant birds, scary snakes and what not). Spice gardens are tiny show gardens where various kinds of spices are cultivated for use in traditional medicine. They are dotted around Kandy and Matale, and are a great way to learn about the characteristics of different spices and their use in local cuisine and medicine. I quite like Euphoria Spice & Herbal, which is an environmentally and socially responsible spice garden and restaurant. Not only does it offer great tours, but you can also try your hand at a Sri Lankan cooking class. Several centuries ago, it was believed that the ‘Garden of Eden’ existed on the top of a very high mountain, or on an island. A Florentine Monk found the view at the top so beautiful that he likened it to paradise. The peak goes by several names, all attributed to a huge ‘fossilized footprint’ found at the top, and depending on which religious sect you ask, is believed to have been left behind by different Gods and Apostles. It’s a bit of a journey to get up there; there’s a lot of inclined trekking, and also around 5000 (!) steps involved in the process. This is one of those treks that is best done at night time, allowing you to get to the peak just in time for sunrise. If you pay close attention, you can also catch a glimpse of the mysterious triangular shadow that doesn’t quite match up to the shape of the mountain. The elephant is an iconic animal that has been ingrained in Sri Lankan culture and tradition for more than 2000 years. Unfortunately, unchecked game hunting during the Colonial Era depleted the population to near-extinction. The Pinnawala Elephant Orphanage was a largely successful attempt to revive the population back to pre-colonial levels. It started out by caring for orphans, but now takes in any injured or maimed elephant as well. Today, the Orphanage is home to the largest herd of captive elephants in the world. Visitors can get to interact with these gentle giants up close via activities such as feeding or bathing the elephants. Unlike elephant rides, which are inherently cruel to the animals, extra special care is taken at the Orphanage to ensure that the interaction is safe; for the elephants as much as for the visitors.